Sales, service and 24/7 monitoring for security systems, alarm systems, fire systems, and camera systems. Security Sales and Service has been installing home and business security, alarm and fire systems for over 30 years. They offer 24/7 monitoring and customer service to answer any questions and service your system. The company is family owned with a strong history of earning their customers’ trust and loyalty. 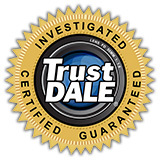 TrustDale's analysis finds you can't beat Security Sales and Service when it comes to price and protection. What's more they guarantee they will never raise your monthly rate as long as you remain a customer. Need more convincing? They will not hold you to a contract should you elect to leave. This family owned business does not "sell" security systems; They inform potential customers about a range of options and educate you to make the best choice - for you. Security Sales and Service only installs equipment that is proven and has performed as promised. Top that off with "local" in-state security monitoring, and you can't go wrong. Your inquiry to Security Sales and Service begins with a friendly person answering your call locally. Owners Tom and Deborah Lackey will assure you they are available to their customers 24/7 to answer any questions and provide exemplary service. Products & Services: Sales, service and 24/7 monitoring for security systems, alarm systems, fire systems, and camera systems.